Steeltime - Women's Stainless Steel Fireball Pendant & Earring Set w/18" Chain Only $17.99 Plus FREE Shipping! You are here: Home / Great Deals / Steeltime – Women’s Stainless Steel Fireball Pendant & Earring Set w/18″ Chain Only $17.99 Plus FREE Shipping! Steeltime – Women’s Stainless Steel Fireball Pendant & Earring Set w/18″ Chain Only $17.99 Plus FREE Shipping! With these dazzling stainless steel earrings and a matching pendant, you will look like a princess. Drizzled with CZ stones, the sets make a romantic gift- or a nice little treat for yoursel! 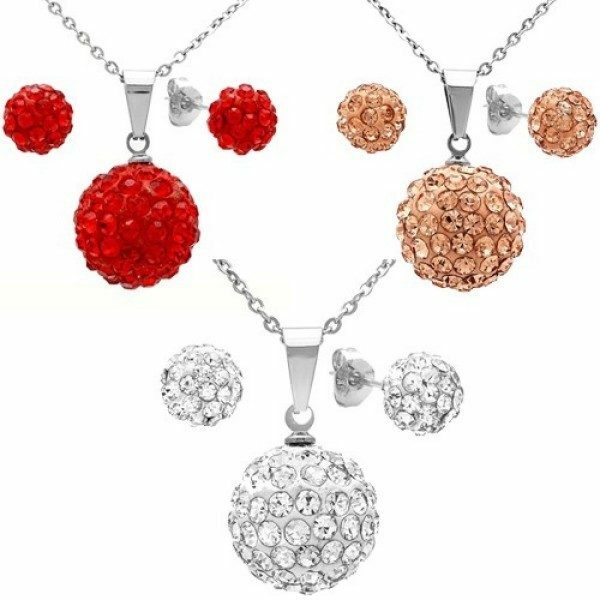 The Steeltime – Women’s Stainless Steel Fireball Pendant & Earring Set w/18″ Chain Only $17.99 Plus FREE Shipping are available in Red, Peach and Clear!